Gets past the hard dialogue to help achieve enriching relationships.
" 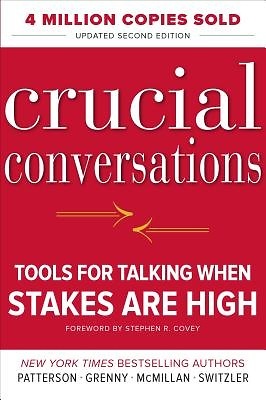 Crucial Conversations] draws our attention to those defining moments that literally shape our lives, our relationships, and our world. . . . This book deserves to take its place as one of the key thought leadership contributions of our time." "The quality of your life comes out of the quality of your dialogues and conversations. Here's how to instantly uplift your crucial conversations." "Coming in as the new CEO of an organization with many tenured employees, I have had many crucial conversations. Using Crucial Conversations as my playbook during this time was paramount in guiding me through each conversation." "Any book is powerful if you can relate to its content, is simple to understand, easy to apply, and is based on research. I have found all of these elements in Crucial Conversations. The narrative has a universal appeal and the strength to transcend cultures." "I was personally and professionally inspired by this book--and I'm not easily impressed." --Maureen Burke, Training Manager, Coca-Cola Enterprises, Inc.
Crucial Conversations exploded onto the scene ten years ago and revolutionized the way people communicate when stakes are high, opinions vary, and emotions run strong. Since then, millions of people have learned how to hold effective crucial conversations and have dramatically improved their lives and careers thanks to the methods outlined in this book.